The Eucharist is celebrated on Sundays (in English) with an 8 a.m. Eucharist in the side chapel, and a Sung Eucharist at 9.30 a.m. in the main church. The mid-week service on Wednesday at 10.30 a.m. is held in the Chapel, and on the first Wednesday of the month MU (Mother’s Union) members provide morning tea in the Undercroft. There is an early service in the chapel on Fridays at 7.30 a.m.
All services use the Second Order form in A Prayer Book for Australia. Hymns are chosen mainly from Together in Song. Music is considered an important part of the 9.30am Sunday worship. The organist and choir support a traditional style of choral Eucharist which is much valued by the congregation. The Friends of Anglican Music come at regular intervals to sing Evensong according to The Book of Common Prayer and this is always well attended. The next Evensong is Saturday 4 August. We also hold regular Sunday evening services in the style of Taize. A number of different yet complementary strands of spirituality characterise the parish. In earlier years, the three centres (at St Aidan’s Box Hill South; St Philip’s Box Hill North; and St Peter’s Box Hill) operated as separate churches, each with its own Parish Council which met monthly, but with a Central Council which met quarterly. The worship at both St. Aidan’s and St. Philips’ was perhaps less formal than that at St. Peter’s, which most strongly identified itself with the part of the Anglican Church known as liberal catholic. The united Parish seeks to value all three of the traditional Anglican sources of authority (scripture, reason and tradition) in a genuine balance, and this is done within a climate that accepts and values diverse theological perspectives. In liturgical practice our sacramental focus is valued, and such features as Eucharistic vestments, candles, servers, reverencing the altar, and the sign of the cross in blessing and absolution, are an accepted and expected part of the liturgical life of the parish. We use the three year Lectionary which informs the Scripture readings and preaching Sunday-by-Sunday. Lay Eucharistic assistants are licensed by the Archbishop. The Sudanese congregation worships in Dinka, and some worship materials have been translated into that language. 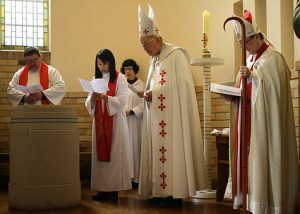 The Chinese congregation worships in Mandarin using the translation of the Anglican Diocese of Hong Kong and worship music translated into Chinese. The parish is characterised by its harmoniousness. Its people pray and care for each other in a quiet and unassuming way and are gently hospitable and friendly. Individual convictions and preferences might be held but there is a noticeable absence of factions in the congregation. Study groups are held during Lent and Advent, under the leadership of the Vicar and retired Bishop George Hearn. A previous incumbent (a Third Order Franciscan) introduced the parish to the simplicity and sincerity of Franciscan spirituality, a legacy of which remains in the tangible form of the inspiring San Damiano cross above the altar in the St. Francis Chapel at St. Peter’s.